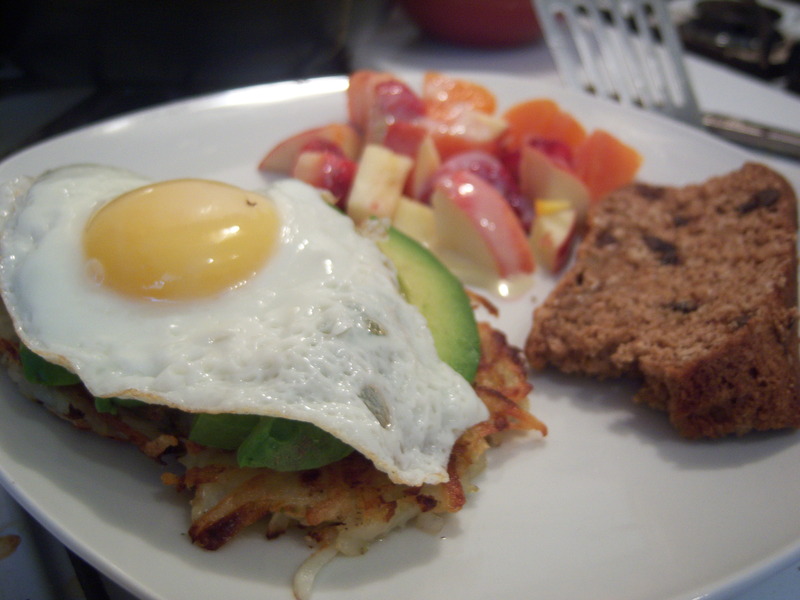 Ultimate breakfast: Hash brown with fried egg & avocado, fruit salad and spice cake. So this was a post-exam celebratory breakfast and I went all out… The celebration actually started the night before when Jo and I made a [[spice cake]] that was put to good use in the morning. 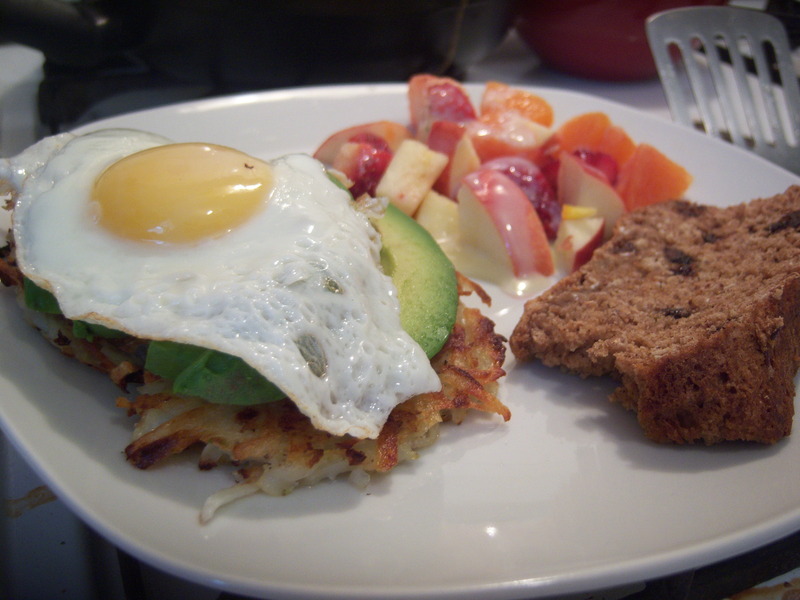 The menu went something like this: Hash browns with fried eggs and avocado (adapted from shutterbean), fruit salad, spice cake and coffee. Yum yum. In a medium bowl, mix together shredded potatoes, grated onion, 1 tablespoon olive oil with a pinch of salt & pepper. Coat a non stick skillet with 1 tablespoon olive oil and turn heat on medium high. Place two individual mounds of the potato mixture on your skillet and cover with a sheet of aluminum foil.After 6-8 minutes the bottoms should be browned. 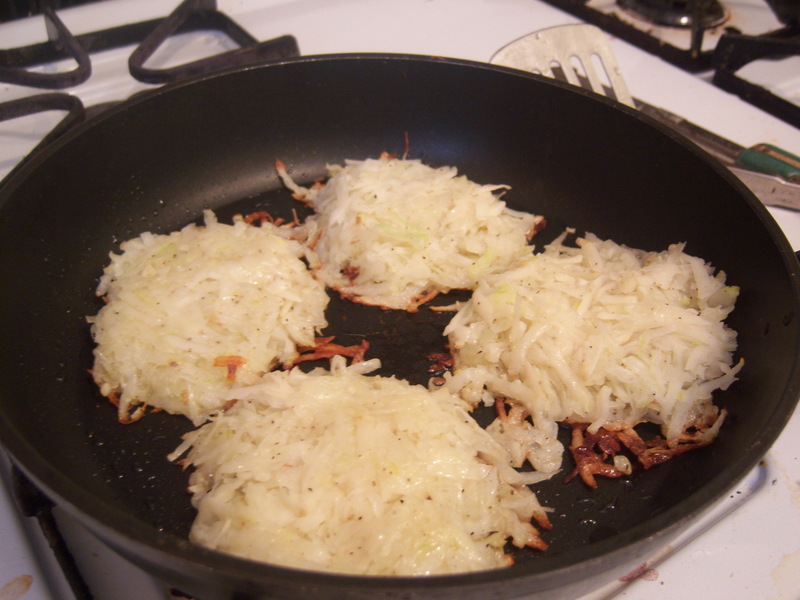 Add another tablespoon olive oil to the skillet and flip the hash browns and cook for another 6-8 minutes. Plate the hash browns and add half of the sliced avocado on top of each mound. Season with salt. In the same skillet fry the eggs. Ater about 3 minutes, your eggs should be perfect. Place them on top of the avocado & add some salt, pepper (and a few dashes of hot sauce). Serve with fruits salad and cake. ← Avocado and mango spring rolls = best party dish ever!